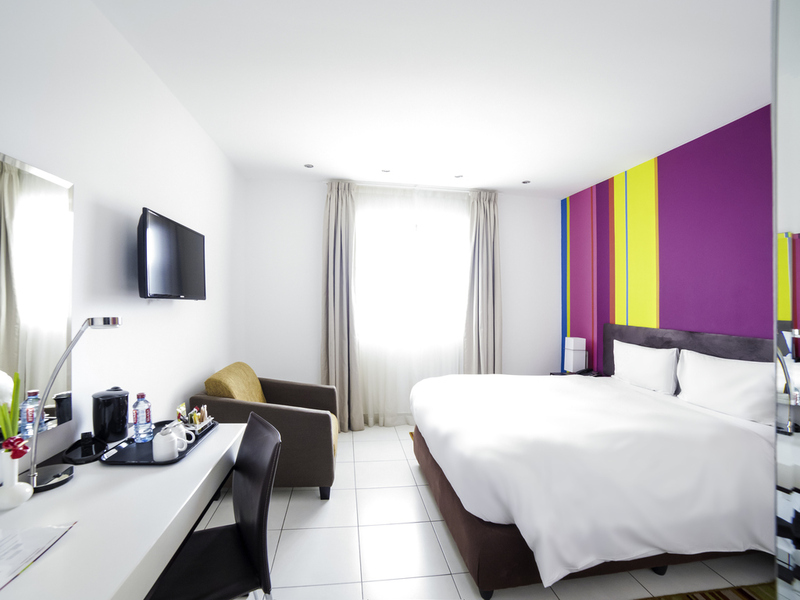 Located onsite at the Kotoka International Airport, the ibis Styles Accra Airport offers an escape from the hustle and bustle of the airport. The hotel has 192 rooms with colourful, friendly decor and theme. The hotel is ideal for business travellers with access to free WIFI, 3 meeting rooms for any business requirements while being located in the heart of the business center. The hotel offers various amenities such as fitness room, Thai massage and Spa room, and outdoor pool, 2 bars and a restaurant. Junior suites have one queen-size bed, digital satellite television, shower, safety deposit box, visitors lounge, and mini fridge. The hotel offers an extensive range of facillities including: the Ewia restaurant, two bars, a gym, a pool and secure parking. NB: No Room Service Available. Standard rooms have one queen-size bed, digital satellite TV, tea and coffee making facillities, WIFI, safety deposit box, mini bar and all rooms have showers. Rooms for persons with reduced mobility offer one queen-size bed, digital satellite TV, tea and coffee making facillities, WIFI, safety deposit box, mini bar and all rooms have showers. The Ewia restaurant is a 104 seater restaurant which serves an elaborate continental all-you-can-it buffet breakfast and a choice of a la carte or buffet meals for lunch and dinner. This restaurant is open to both resident and non resident guests. The Main bar is located in the lobby area and opens everyday of the week for bar service and light meals. WIFI is available around this bar for the convenience of our guests. The Pool bar is located on the first floor and opens everyday of the week for bar service and light meals. WIFI is available around this bar for the convenience of our guests. Dear Mr. Nobuya S., We very much appreciate your comments regarding your stay at the ibis Styles Accra Airport. It is always a pleasure to receive positive feedback. We will share your comments with our team. We are sure that this feedback will serve as an encouragement to all of our staff as we strive to continuously improve the quality of our services. Regarding the Wifi, we would like to take the opportunity to inform you that our internet capacity is unlimited, however the Wifi code is limited to a number a devices. Please do not hesitate next time to contact the reception to request for additional codes for internet. Customer satisfaction being our priority, we thank you again for sharing your experience, and we hope your next visit will be as pleasant as the previous one. Yours Sincerely, Khalid SILBOUHALI General Manager.